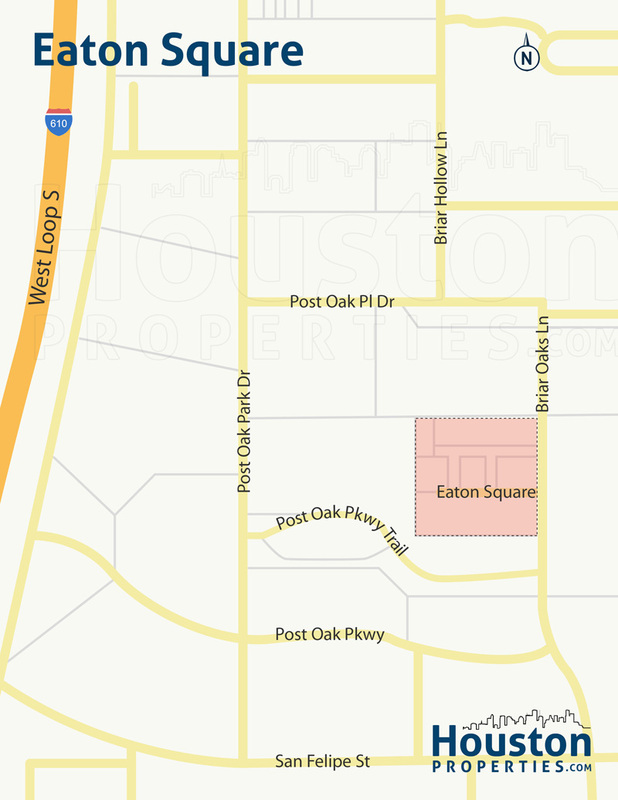 One of Houston’s Best Gated Communities, Eaton Square is an upscale residential enclave made up of 15 homes. Eaton Square is an exclusive residential enclave located between River Oaks andTanglewood, two of Houston’s most expensive neighborhoods. One of Houston’s best gated communities, Eaton Square homes feature Neoclassical architectural style with an elegant Old-World vibe. EXCLUSIVITY: Eaton Square is one of Houston’s Best Gated Communities. The neighborhood’s homes are among the most expensive in Houston, with prices starting at $1 million. SUPERB LOCATION: The neighborhood is less than a mile from The Galleria and less than 20 minutes from Downtown Houston. Eaton Square also has easy access to other great entertainment, shopping, and dining options, as well as to key business and employment districts of Houston. EXCELLENT SCHOOLS: Eaton Square Houston is zoned to the largest school district in Texas, Houston ISD. According to Houston’s Best Schools guide, the neighborhood is serviced by top-ranked public schools including Lanier Middle School and Lamar High School. SECURITY: The residential enclave offers a fully gated community manned by armed guards 24 hours a day. 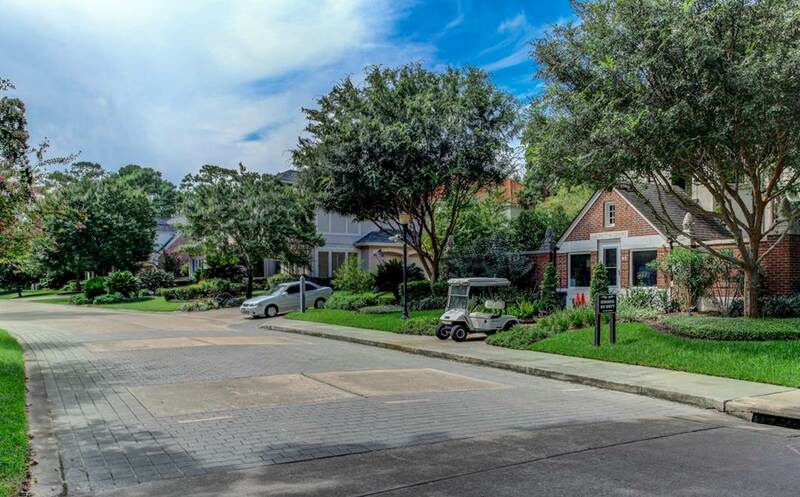 GREAT ACCESS: Eaton Square homes have easy access to the main roads of 610 Loop, Buffalo Speedway, Katy Freeway, Westheimer Road, and Southwest Freeway, making for a comfortable drive or commute in the city. The limited inventory and high price ranges make the Eaton Square real estate market challenging for most home buyers. Contact Paige Martin, one of Houston’s Best Realtors and one of Eaton Square’s most active real estate agents, if you’re looking to buy or sell Eaton Square homes for sale. Enter your email to get this free Gated Communities Guide in easy-to-read PDF format. Bonus: Also see how Eaton Square compares with nearby luxury gated communities. I am interested in Eaton Square and would like to get more details. Made up of 15 luxury homes, Eaton Square is a gated community with garden homes and townhomes arranged around a central area. Eaton Square is one of Houston’s Best Gated Communities. The neighborhood’s homes are among the most expensive in Houston, with prices starting at $1 million. The neighborhood is less than a mile from The Galleria and less than 20 minutes from Downtown Houston. Eaton Square also has easy access to other great entertainment, shopping, and dining options, as well as to key business and employment districts of Houston. Eaton Square Houston is zoned to the largest school district in Texas, Houston ISD. According to Houston’s Best Schools guide, the neighborhood is serviced by top-ranked public schools including Lanier Middle School and Lamar High School. The residential enclave offers a fully gated community manned by armed guards 24 hours a day. 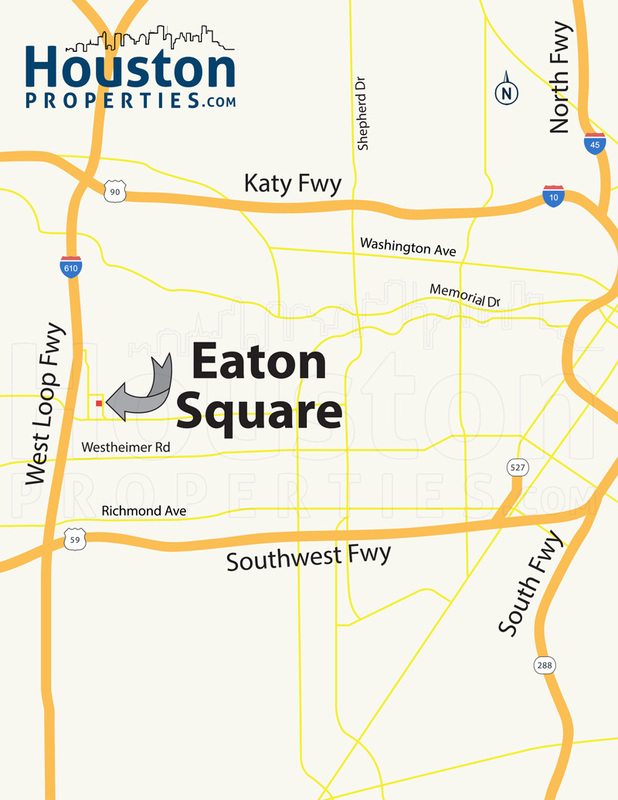 Eaton Square homes have easy access to the main roads of 610 Loop, Buffalo Speedway, Katy Freeway, Westheimer Road, and Southwest Freeway, making for a comfortable drive or commute in the city. Other key districts like Greenway Plaza and the Texas Medical Center are easily accessible from the neighborhood. Some of the hottest retail centers in the area are blocks away from the neighborhood, including European-style shopping center Uptown Park as well as upscale malls River Oaks District and Highland Park. Named for Eaton Square (one of the most exclusive places to live in the UK), the gated community broke ground in 1997. It was a brainchild of prominent builders Robert Davis and William Carl, in partnership with architect Lucian Hood. The gated community’s architecture also draws inspiration from English and Neoclassical designs, with white stucco exteriors, hipped roofs, and columns. Eaton Square homes mostly feature 3- to 4-bedroom (4 to 6 bath) floor plans with around 4,300 to 6,500 square feet of living space. Lot sizes average at just under 5,000. 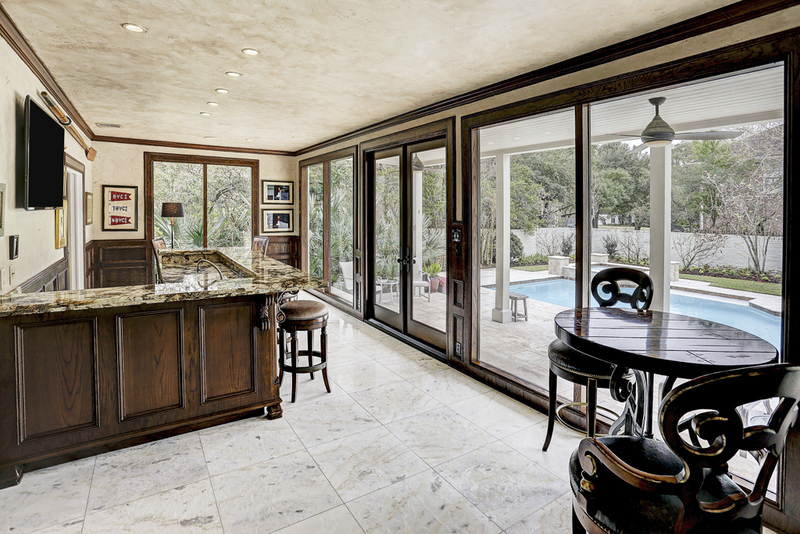 Luxury amenities like elevators, well-maintained yards, fireplaces, custom closets, and wine cellars come standard. Prices for Eaton Square homes for sale can start at around $1,300,000. Bigger properties in the community can fetch over $2,000,000. Made up of 15 garden homes and townhomes, Eaton Square is an upscale gated community in Briar Hollow. The community’s 24-hour manned entrance is located just off Briar Oaks Lane, a couple of blocks away from San Felipe Street, Post Oak Parkway, and Loop 610. Other key thoroughfares like Westheimer Road, Post Oak Boulevard, and Willowick Road are minutes away from the Eaton Square. Other gated communities in Briar Hollow include Audubon Hollow, Raintree Place, and River Hollow. Thanks to Eaton Square’s location within Briar Hollow, residents have fairly easy access to several shopping destinations, including The Galleria, River Oaks District, Highland Village, and Uptown Park. The community is less than a mile away from the Galleria area, one of Houston’s main retail and employment centers. Home to over 5,000,000 square feet of leasable space and about 23,000,000 square feet of office space, the area has over 2,000 businesses and around 50,000 employees. Other key employment and business districts are also easily accessible from Eaton Square, including Greenway Plaza (about 2 miles away), downtown (8 miles), and the Texas Medical Center (about 6 miles). Eaton Square homes are zoned to the Houston Independent School District (HISD). St. George Place Elementary School at 5430 Hidalgo St. Also known as St. George Place Elementary, the school is an International Baccalaureate World School serving the Primary Years Programme (PYP). It also serves a Vanguard neighborhood program for gifted and talented students. Lanier Middle School at 2600 Woodhead St. Lanier Middle School was established in the 1920s and has received the Texas Gold Performance Award (2011). The school serves an International Baccalaureate program (Middle Years Programme) as well as a gifted and talented Vanguard magnet program. Lamar High School at 3325 Westheimer Rd. An IB World School serving the Diploma Programme, Lamar High School boasts of the most number of IB diploma graduates in Texas. It also serves a Business Administration magnet program and several Advanced Placement courses. Also known for its athletics, Lamar is home to one of the oldest lacrosse programs in Texas. The following are some of the more notable private schools near Eaton Square. To find an updated listing of all Eaton Square real estate zoned to any specific public school, please send an email to Paige Martin at Paige@HoustonProperties.com with the property preference and budget that you’re working with. Eaton Square is only made up of 15 luxury homes and very few (3 homes) have been placed in the market over the last 10 years. The exclusive community is among the most desirable addresses in Houston, partly because of its central location, upscale homes, and easy access to key districts. There have been, however, very few homes put up on the market every year (historically, less than 20 public home sales each year). Given the limited data, Eaton Square real estate trends are not statistically relevant. 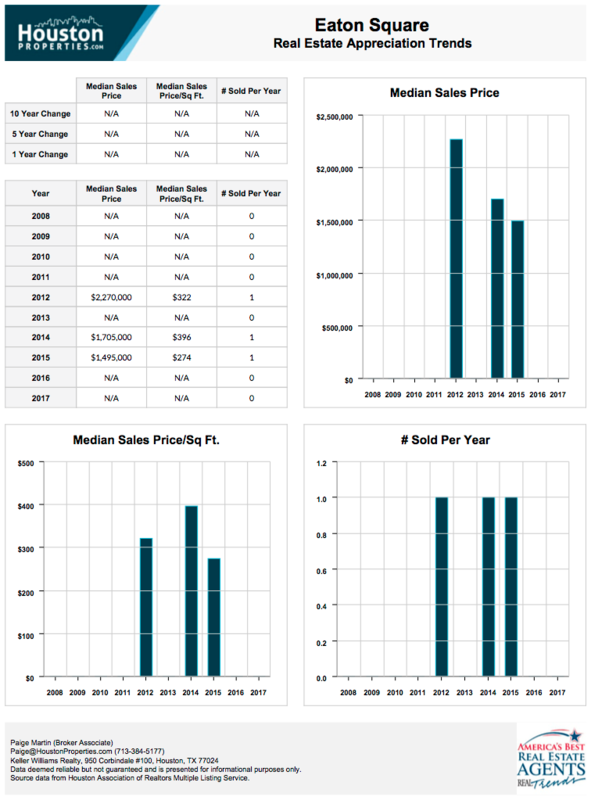 For updated information regarding Eaton Square real estate pricing and trend analysis, please contact Paige Martin at Paige@HoustonProperties.com. The community is known for its English and Neoclassical architecture, with homes featuring white stucco exteriors, hipped roofs, and columns. Eaton Square homes tend to feature elevators, manicured yards, fireplaces, custom closets, hardwood floors and wine cellars. Eaton Square homes for sale can start at around $1,300,000. Bigger properties in the community can fetch over $2,000,000. There are no mid or high-rise condos within the community of Eaton Square. Briar Hollow and nearby neighborhoods like the Galleria and River Oaks have plenty of condos within their borders. Unit sizes, floor plans, and building amenities vary. Briar Hollow, mixed use neighborhood directly west of River Oaks and south of the Buffalo Bayou, used to be farmland. Development (small gated subdivisions and condominiums) in the area started during the 1970s. Today, the neighborhood is home to several exclusive and gated neighborhoods, including Raintree Place, Audubon Hollow, Eaton Square, and River Hollow. Thanks to its location within the Briar Hollow/Post Oak area, Eaton Square is mere minutes away from some of Houston’s hottest retail, dining, and entertainment hotspots. The Galleria/Uptown Park area, for one, offers more than 5,000,000 square feet of retail space. The Galleria, one of the largest retail centers in the country, has over 2,000,000 square feet of leasable space. Macy’s, Neiman Marcus, Nordstrom, and Saks Fifth Avenue serve as anchors. Uptown Park (a European-style shopping center), as well as upscale destinations Highland Village and River Oaks District are all within a few blocks of Eaton Square homes. For outdoor entertainment options, residents can take a short drive to Memorial Park. The 1,400-acre park is home to the Memorial Park Golf Course, the Lieberman Exer-Trail (and miles of hike-and-bike trails), sports facilities (including swim and tennis centers), and an arboretum and nature center.